This long, graffiti-covered street is home to lots of cool coffee shops, cafes and homeware independents, as well as vintage and second-hand stores. I ventured down Stokes Croft in search for Poco, a tapas bar renowned for its sustainability credentials. Poco’s menu is 100% seasonal, organic and locally grown. They aim to be zero waste by respecting their incredible ingredients, purchasing less packaging, recycling and composting. Inside the restaurant they have a large black board detailing those producing the ingredients used that day. 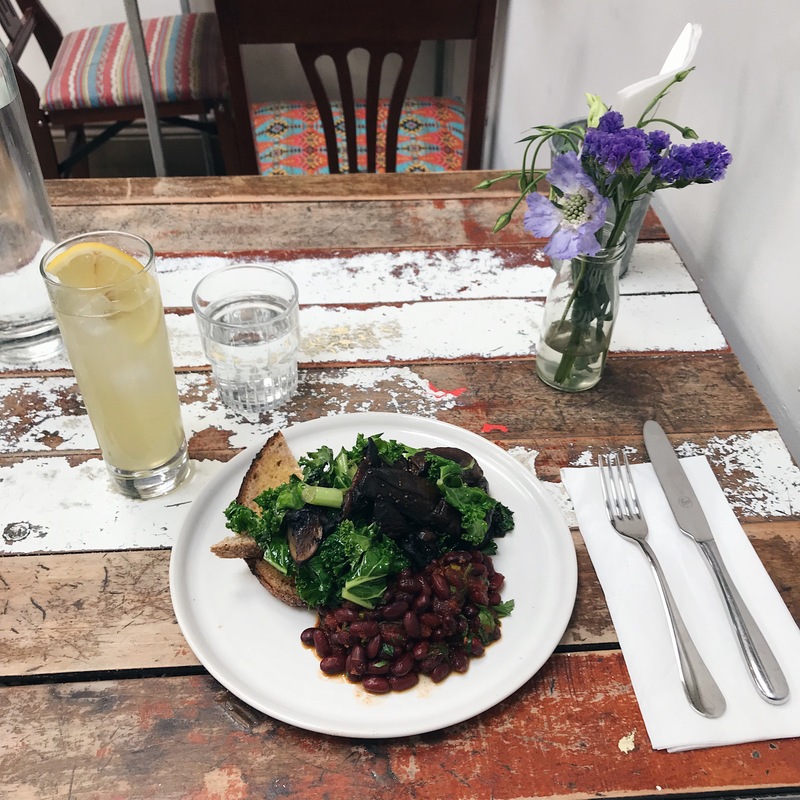 As it was coming up to midday I ordered the vegan brunch (mushrooms, greens and harissa beans on sourdough), which tasted fresh and nutritious. I quenched my thirst with a delicious, homemade lemonade. The atmosphere was inviting, bright and airy with kind staff and a calming playlist. I wish I could’ve stayed there all day, reading and eating in a continuous cycle. Maybe on my next visit to Bristol… I definitely want to return for the tapas menu in the evening that’s for certain! As is now tradition whenever I go away without Ollie, I bring back either coffee or chocolate. It was coffee this time and I opted for Triple Co Roast, a roastery on Stokes Croft aiming to roast high-quality beans through direct trade with bean farmers. They believe in an ethical supply chain that rewards farmers and pays out bigger premiums for their hard work. I went for their latest Costa Rican coffee from La Trinidad. The beans are farmed through a Community Coffee program with CoopeTarrazu, which encourages greater attention to traceability and provides opportunities for small producers to achieve recognition for their coffees. Whilst I’m no coffee connoisseur, I can tell you it’s amazing smelling and tasting coffee! Clifton is full of cafes, restaurants, boutiques and salons. Its beautiful, traditional Georgian architecture and nearby parks and gardens makes it the perfect area to stroll around on a sunny day. I was drawn to Clifton Village by the stationers heaven that is Papersmiths. This Instagrammable store is filled with everything you could want for your writing and reading pleasure. I spent a good 30-minutes fawning over every other pen, pencil and pot of ink. As a serious card lover, I can say they have a great selection – though I didn’t spot my favourites (ola studio and Hanna Werning)! There were a number of coffee table books and magazines I had my eyes on too, though sadly Ollie and I are on a book ban until we’ve moved house! I did, however, have room in my holdall case for a Walk With Me pencil case made from a single piece of recycled leather and an old issue of Renaissance, the magazine exploring the beauty of age with only models over 40. Discounted magazines don’t count within the book ban, right?! I fell upon Wainwright’s on my way out of Clifton when I fancied an iced coffee to keep me cool and caffeinated on my hot journey back to London during the summer heatwave. Wainwright’s focus is on speciality coffee and seasonal food, seeking to serve on ethically-sourced coffee from Clifton Coffee Roasters and Triple Co Roast. It’s the perfect spot to relax and refresh. HOKO is a minimalist, independent boutique stocking a curated selection premium mens and womenswear by the likes of Baserange, Margaret Howell, Aries and Our Legacy. Scented with and stocking Aesop, there’s also a small collection of fragrance, skincare and homeware. It’s definitely worth a browse if you’re in the area as they regularly release small new collections. 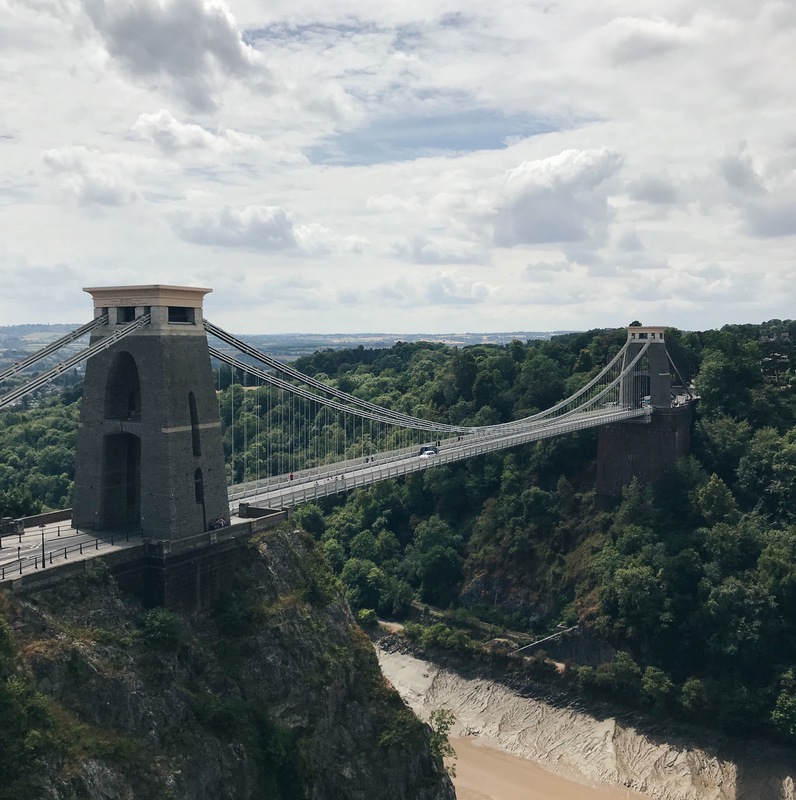 You can’t visit Clifton Village without a stop at the suspension bridge, connecting Bristol to Leigh Woods. 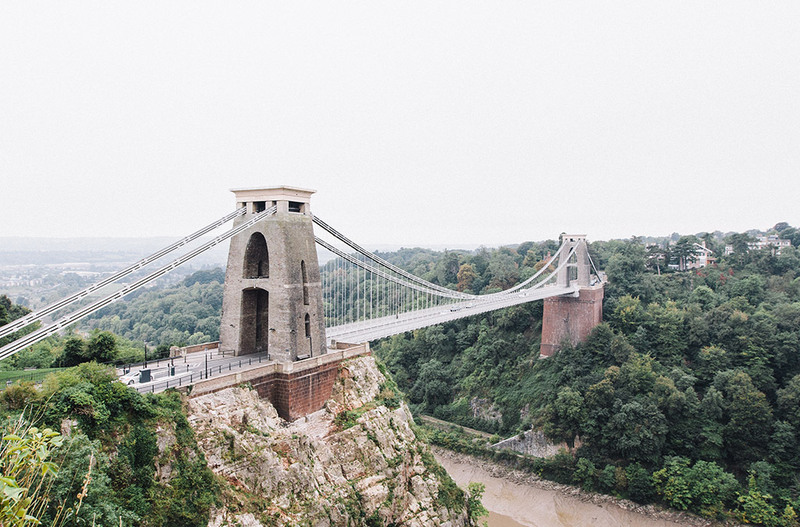 This glorious bridge provides a stunning view of the Avon Gorge river and its cliffs. The bridge opened in 1864 and has been a landmark since. It was designed by the Victorian engineer Isambard Kingdom Brunel, who died in 1859 before the bridge had been completed. The bridge is said to have been completed as his memorial and is known as Brunel’s bridge. They were the highlights from my half day in Bristol, but I’d love to know yours. Where should I go next time I’m in the city? Let me know by leaving a comment. Previous Who made my Activewear?